Investor’s Business Daily has published this editorial Midterm Elections: 5 States Could Wreck Their Economies In Futile Fight Against ‘Climate Change’ Excerpts in italics with my bolds and titles. Election 2018: Next week, voters in five states will decide whether they want to raise their own taxes, kill jobs and lower their standards of living. All in a fanciful effort to stop “global warming.” They’d be better off letting the free market do the work. Washington, Arizona, Nevada and Colorado all have global-warming ballot initiatives, each heavily financed by environmental activists. New Mexico voters will decide whether to elect a powerful land commissioner who promises stiff curbs on emissions. None of these will make any difference in the global climate. But they will cost their residents dearly. How Much do We Love the Climate? Let us count the ways. 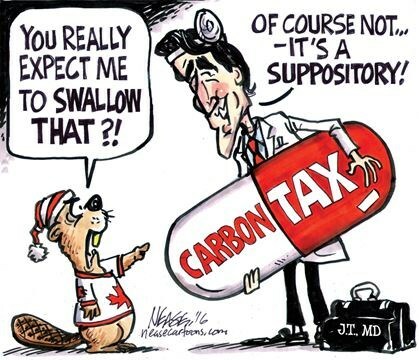 How about a carbon tax on everything? In Washington, voters will decide whether to be the first state to impose a carbon tax. Initiative 1631 would slap a $15 tax on each ton of CO2 emissions starting in 2020. That would climb by $2 every year after that. 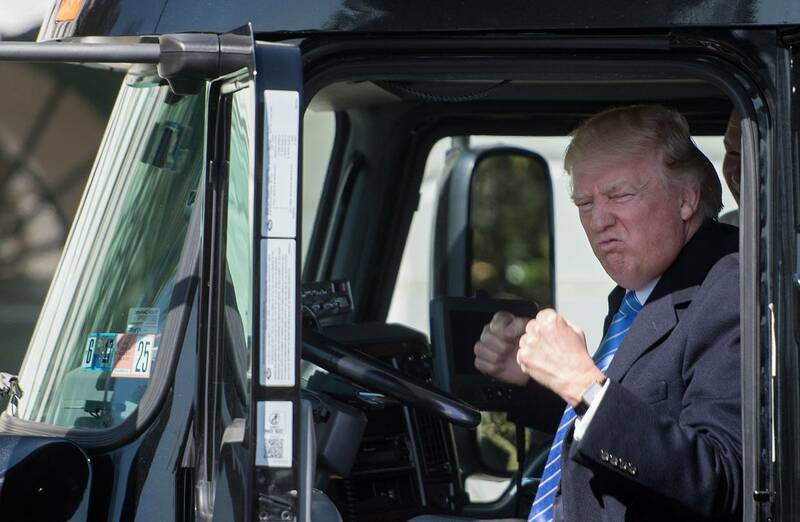 This tax will hit everything, from gasoline prices (up by as much as 59 cents a gallon) to electricity bills to everyday household goods. That translates into hundreds of dollars a year for a typical household right out of the gate, with costs climbing to nearly $1,000 a year by 2035. An analysis by the National Economic Research Associates also found that the tax would cut the state’s growth by 0.4% in the first two years. 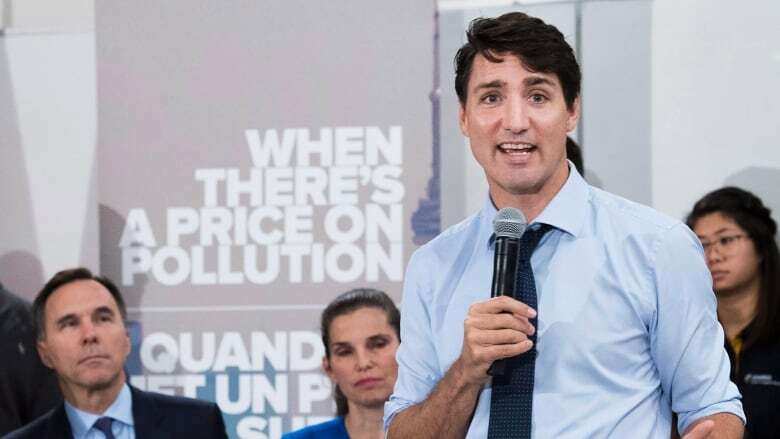 Even more absurd than the tax hit, however, is the fact that the initiative includes numerous exemptions — such as on aluminum production and fuel bought by government. Talk about pointless. The U.N. says that the entire world would have to slap carbon taxes of up to $5,500 per ton to avoid a supposed climate-change catastrophe. Washington state’s action will only hurt Washington residents. In other words, Washington’s tax amounts to nothing more than very expensive virtue-signaling. 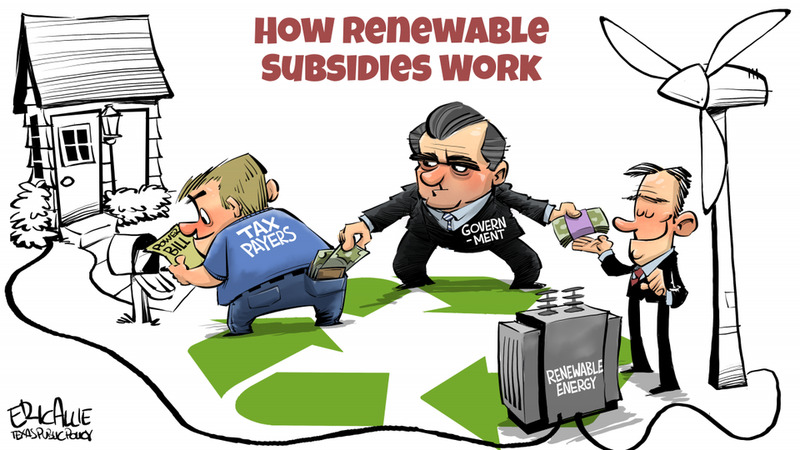 How about imposing Costly Renewable Mandates? Voters in both Arizona and Nevada, meanwhile, will decide whether to boost their mandates on renewable energy. Both initiatives would force utilities to get half of their electricity from renewables like wind and solar by 2030 — less than 12 years from now. As Stephen Moore explained in these pages recently, these renewable mandates are a punitive tax on the poor and middle class. Why? Because these mandates raise the cost of energy. Moore notes that a Manhattan Institute study found that eight of the 10 states with the highest electric bills had renewable-energy mandates. “We are talking about hundreds and sometimes thousands of dollars of higher costs every year to homeowners,” he says. And because energy costs represent a bigger share of the budgets of lower-income families, these hikes end up being regressive taxes. The impact on global warming? Less than negligible. How about putting severe Limits On Fracking? Over in Colorado, voters will have the chance to severely limit the ability of oil and gas companies to extract energy in the state using the state-of-the-art drilling technology known as fracking. Initiative 97 would ban oil and gas wells within 2,500 feet of homes, businesses and protected lands. That would effectively ban drilling in about 85% of the state. This is a particularly ludicrous effort since fracking is responsible for a significant decrease in CO2 emissions over the past decade. The fracking revolution opened vast supplies of natural gas to drillers, which sharply lowered natural gas prices. That, in turn, made natural gas (which emits less CO2) more competitive than coal (which emits more). As utilities switched, CO2 emissions dropped. Banning or limiting fracking will make such gains more difficult. How about Cutting Methane Emissions? The Democrat running for this job, Stephanie Garcia Richard, has promised to cut down on methane emissions. Since the state owns nine million acres of land, a crackdown on methane leaks from oil and gas operations there has the potential to severely hamper the industry, along with the well-paying jobs that go with it. But methane emissions in the state have been dropping on their own. That’s thanks to industry-driven advances in the technology. In 2017 alone, emissions dropped by more than 50%. Forcing still deeper cuts in methane emissions will likely cost the industry — and the state’s economy — plenty, but will do nothing to change the global climate. Give Elsie a break on this methane madness. Voters in these states should know that while they’re deciding whether to impose these costs on themselves, the free market has been making huge inroads in cutting CO2 emissions, without any carbon taxes, mandates or Paris climate accords. The Energy Information Administration reports that CO2 emissions from electric utilities has dropped so much in recent years that they’re now lower than they’ve been in more than 30 years. EIA data show that the decline is due not only to fracking. It also the result of increased economic efficiency. This increased efficiency, mind you, has little or nothing to do with federal regulations or mandates. It is the result of the relentless pressure a competitive free market puts on companies to wring out every ounce of waste and inefficiency. Next week, voters in these five states will have a unique opportunity to send a loud message to the rest of the country. Namely, that they aren’t buying the global-warming hysteria. We can only hope they do so. It took 15 years, but Brazilians finally woke up to the failure of socialist theory and voted them out of power. It wasn’t so much their belief in the new guy, but the fact he was stabbed during the campaign revealed how much the left will do to stay in power. To understand why the election went as it did, see this short video by a Brazilian journalist. The socialist mantra has been “From each according to his ability, To each according to his need.” That ideology claims to organize outcomes to match individual needs by government collecting all the production and distributing it equally. That sort of government has failed every time, whether in Romania, Cuba, East Germany, or elsewhere. Not only because of corruption by the elite, but also because it defies human and social reality. In this respect, it is analogous to the failure of abstract global warming theory to explain particular local and regional anomalies. A good insight into the fundamental problem with socialist theory is an article Income Inequality Is a Natural and Desirable Feature of Labor Markets by Joseph Michael Newhard. Excerpts in italics with my bolds. Redistribution makes a mockery of the concept of equality, merely facilitating a leisure class that lives at the expense of laborers. 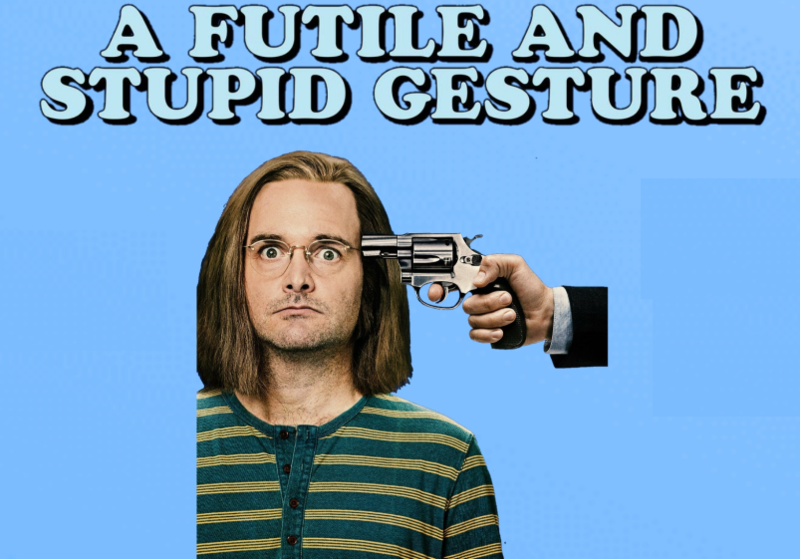 With the next presidential election already looming, it’s as certain as death and taxes that another round of hysterical demagoguery is upon us. Among the regurgitated bromides will be complaints about that tired socialist bogeyman of income inequality. Yet, when envy gives way to economic analysis, we find these grievances to be without merit. Income inequality is a desirable feature of labor markets, arising naturally wherever workers are free to choose from among the seemingly endless number of career paths and lifestyles afforded by a modern economy. One source of income inequality is differences in how much free time we want. Everyone values both income and leisure, but increasing one necessarily reduces the other—this is the labor-leisure tradeoff. People who highly value free time choose to work less than their peers. Income inequality results even between workers who are identical in every other way. However, it is an error to interpret this inequality as evidence of inequity. These workers are choosing to earn lower incomes in exchange for more leisure time and consider themselves better off for having the option. Political charlatans may propose redistribution but will succeed only in decreasing the number of workers by artificially rendering indolence relatively more attractive. Effort is another source of income inequality, especially in certain occupations. If two salesmen are the same in every way except one is driven by his work ethic to make more sales calls, income inequality can result. Greater opportunities for career advancement will also tend to fall to such workers. Each worker is optimizing, with one preferring a more laidback work experience in exchange for a lower income and the other judging that more income is worth the additional effort. It is misguided to conclude that the resulting income gap is an injustice. Equalizing differences, or compensating wage differentials, is another source of income inequality. The many jobs available to us are of dissimilar unpleasantness, dirtiness, difficulty, security, or riskiness of injury or death. Jobs that are relatively unattractive in such ways must offer a wage premium to attract workers who will otherwise seek more favorable employment. If coal miners earn a higher wage than schoolteachers in Appalachia, then far from constituting inequality, this premium is, in fact, necessary to make both types of workers equally well-off at the margin (that is, “equalizing”). Last are the investments we make in our own human capital. Americans with more education tend to earn higher incomes. Yet, educational attainment requires years of sacrifice. Wages and leisure time are forfeited. Studying and tests displace parties and video games. Many desirable purchases are delayed. One loses touch with friends and family. Marriage and children may be postponed or avoided altogether. This is a lot to give up, and it is not for everyone, but it is not evidence of inequity when those who sacrificed so much in youth earn higher incomes later in life as a result. If Tyler makes $20 an hour and Jack makes $40 an hour, who is better off? When one understands the numerous factors that drive income inequality, it is clear that we have no idea who is better off based on income alone. If Jack makes more because he has a dangerous job that Tyler wouldn’t do even for $50 an hour, there is no basis for asserting that Jack is better off just because he earns more money. People don’t maximize income; they maximize utility. If college students only cared about maximizing income, they would all major in petroleum engineering. Yet most students major in lower-paying fields. For many students, a mathematically-intensive field like engineering would mean a miserable, mentally draining lifestyle for which the additional income would less than fully compensate for not working in a more appealing occupation. Whether pursuing self-actualization through a career in accountancy, nursing, or acting, we consider not only income but also the costs of training, the appeal of the work itself, and the leisure time the career affords. Income is shaped by preferences like demand for leisure, time preference, and level of risk aversion. Ultimately, it is chosen by each worker as a result of one of the few freedoms we still have: the right to choose one’s own profession. Those who choose video games over long work hours, or partying over college, see a real benefit they deem greater than the value of forfeited earnings. Those who instead pursue higher incomes forfeit these enjoyable activities. We should celebrate that we are free to build a career that offers us an optimal bundle of desirable attributes, with income only one of many considerations. Income inequality is a natural result of this freedom. Income inequality also fulfills an important social function. Higher wages attract workers to fields where their services are highly valued, such as in medicine. If the wage premiums of such professions are eliminated, the incentive to take on important but arduous work disappears. Workers will seek out only the easiest, safest, and most pleasant job opportunities, shunning fields that require years of training or significant physical or mental exertion. Unfortunately, none of this will stop power-mad politicians from courting the votes of those who enjoy the benefits of lower incomes but still demand tributes from their more financially prosperous peers in the name of “fairness.” Offering strawman visions of robber barons and banksters hoarding their ill-gotten gains, oligarchs will ignore the true causes of income inequality, attributing it instead to nefarious forces that only the state can confront. Is it “equality” if Tyler steadfastly refuses every opportunity to apply himself, Jack earns $1000 for the week, and the state gives Tyler half of Jack’s income? They each see the same $500, but Tyler is also able to relax and enjoy his free time while Jack works; they are hardly equally well-off. Redistribution makes a mockery of the concept of equality, merely facilitating a leisure class that lives at the expense of laborers. Living in a world of scarcity means that to get something you want, you must give up something else that you also want. Less stress, more vacation time, or a reduced risk of workplace injury or death are real benefits that people are willing to pay for through a reduced income. Yet, in the end, these nonpecuniary benefits cannot be stolen by the state and given to people who didn’t earn them in exchange for votes; only income can be. Thus, those who enjoy the many advantages forfeited by high-income earners also get to share in the monetary rewards earned by the blood and sweat of their more ambitious neighbors. Joseph Michael Newhard is an Assistant Professor of Economics in the Department of Economics and Finance at East Tennessee State University. Personal economics was already appreciated in Biblical times. St. Paul quoted Deuteronomy and adds the lesson in writing: “For the Scriptures say, It is not right to keep the ox from taking the grain when he is crushing it. And, The worker has a right to his reward.” 1 Timothy 5:18 (BBE). Jordan Peterson adds his description what socialism doesn’t get about human inequalities. 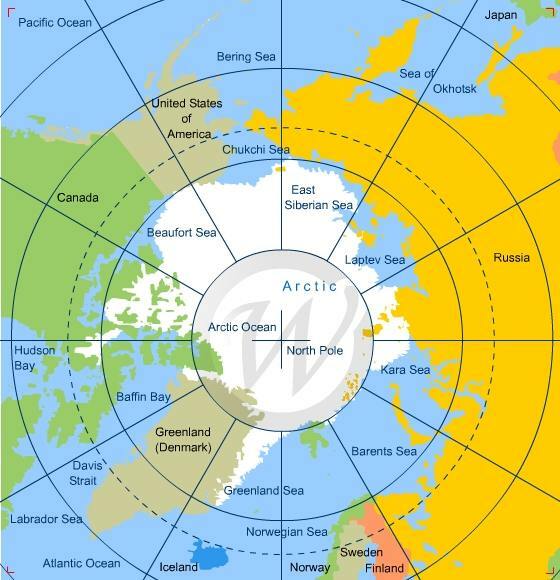 With the Canadian Arctic already frozen over, the action has moved to the Russian side. The image above shows massive gains in ice extent in East Siberian and Laptev basins. East Siberian added 383k km2 for a total of 821, or 75% of last March maximum. Laptev was mostly open water in September, but added 550k km2 in the last ten days for a total of 650k km2 or 72% of last March maximum. The graph shows MASIE reporting ice extents totaling 7.8M km2 yesterday, 400k km2 below the 11 year average (2007 to 2017 inclusive). Note how 2018 started on average, then went fairly flat the first week or so, falling 900k km2 below average. Recent gains in ice extent exceed average gains, closing the gap. Presently, 2018 is about four days behind the average, tracking above 2016, 2012 and 2007. NOAA’s Sea Ice Index is matching MASIE through most of October. The current IMS Snow and Ice Chart shows how snow is covering Siberia completely, and has spread over northern and eastern canada. This post reblogs California Vs. Texas In Electricity: Comparing The Two States 1 In 5 Americans Call Home by Chuck Devore in Forbes. Text in italics with my bolds. The two most-populous states, California and Texas, are home to one in five Americans. More alike than different in many aspects—diverse population and economy, abundant natural resources—the two states differ in one important respect: policy. With some exceptions, California is progressively liberal while Texas is free market conservative. These states’ similarities and differences invite comparisons that can be useful in illuminating policy choices among the states and at the national level as well. This essay is one in a series that examines those differences—in this case, electricity and related efficiency. California policymakers have made aggressive moves towards renewable electricity production and energy efficiency over the past couple of decades. While doing so, they frequently tout the state’s nation-leading electric efficiency and its reduction in carbon dioxide emissions. California does use the least amount of electricity per capita of any state, at 6,536 kilowatt hours per year in 2016, compared to the average of 11,634 kWh nationally and 14,286 kWh in Texas. But, that figure overlooks three very important factors. The first is that more Californians use natural gas for their residential needs (heating their homes and water) than the average American. Thus, on measures of overall home energy efficiency, which takes into account this natural gas usage, California ranks a more average 18th in the nation with Texas coming in 35th. The second is California’s famously mild climate. With 840 miles of coastline adjacent to the cool waters of the Pacific Ocean, the first few miles of densely populated coastal regions enjoy a temperate and dry environment, allowing many homeowners the luxury of rarely using their air conditioners. And home heating demand is very modest during the winter in Southern California, where the bulk of the population lives. On the other hand, the farther one lives from the coast, the hotter it gets—an important consideration for the roughly one-third of Californians who don’t live near the ocean. In contrast, Texas has vast urban areas more than 100 miles from the Gulf Coast, a body of water that, unlike the California’s section of the Pacific, produces heat-trapping humidity. The third and most ignored reason California doesn’t use much electricity is that their tax and regulatory policies and high costs of doing business have steadily driven out industries that use a lot of energy to manufacture things such as steel and cement. There’s irony in this, of course, and it’s this: California’s environmentally-minded leaders like to tout the virtue of their post-industrial policies, but in deindustrializing wide swaths of their economy, they have merely outsourced the energy use—and pollution—to other places and then, to add insult to injury, pay to have it shipped to California in carbon-emitting ships, planes, trains, and trucks. In terms of electric production, California is the nation’s biggest importer of electricity. In the past, this meant a lot of coal-fired power from places such as Arizona and Utah. But a law passed in 2006 alongside the state’s more famous AB 32, the Global Warming Solutions Act, effectively banned the renewal of power contracts from traditional out-of-state coal-powered generators. As a result, “electron laundering” has arisen to fill the gap. This occurs when Californians, in the quest for green electrons to power their grid, pay British Columbians for hydropower, which the Canadians are happy sell, as they backfill their own power needs with coal power from Washington State and Alberta. It works out for everyone: California gets higher-priced power that they can claim is green, while the Canadians get American greenbacks to fund their national health care system. In the meantime, Californians paid an average of 18.41 cents per kilowatt hour for their electricity in July 2018, 67% higher than the national average and more than double the cost of electricity in Texas. In August, California’s rates jumped to 19.08 per kWh, 110% higher than Texas’ rates. In fact, Californians’ July and August electric rates were the highest in the contiguous 48 states. It wasn’t supposed to be this way. In 2004, before the advent of modern and safe hydraulic fracturing techniques that unlocked huge stores of both natural gas and oil in the continental United States, California policymakers feared a looming natural gas shortage. To address this, they planned on up to nine large liquefied natural gas terminals arrayed along the Pacific Coast from Vancouver, British Columbia to Baja California. In addition, they launched an aggressive effort to boost solar and wind power in California, assuring consumers and industry alike that, when the price of natural gas soared, California would look like geniuses for weaning themselves off of natural gas. Reality turned out differently. Instead of rising sharply as the result of shortages, the price of natural gas plummeted 70% in the decade following 2005. This drop in the cost of the fuel that still powers more than a third of California’s grid allowed pro-renewable energy policymakers to mask the true cost of their undertaking, with cheap natural gas power more than making up for the periodic renewable power that required prodigious subsidies and costly backup power sources to keep the lights on. In contrast, Texas pursued a market-based electric policy through deregulation. While liberal consumer advocates were quick to claim failure in the first couple of years after the 2002 electric competition law passed as higher prices signaled more producers to enter the market, in the years since, Texans have seen their retail inflation-adjusted electricity prices decline by 32 percent from 2008 to 2017. California policymakers have now proclaimed their goal of making their electric grid 100 percent renewable by 2045. In addition, there is serious consideration being given to outlawing the internal combustion engine. The growing gap in retail electric prices between highly regulated California and its high cost green energy vs. Texas’ competitive electric market ought to be instructive to observe in the years ahead. To believe humans are dangerously warming earth’s climate, you have to swallow a bunch of unbelievable notions. You have to think the atmosphere drives temperature, instead of the ocean with 1000 times the heat capacity. You have to disregard the sun despite its obvious effects from summer to winter and longer term. You have to think CO2 drives radiative heat transfers, instead of H2O which does 95% of the radiative work. You have to think rises in CO2 cause temperatures to rise, rather than the other way around. You have to forget it was warmer than now in the Middle Ages, warmer still in the Roman era, and warmest of all during Minoan times. And on and on. The global warmist narrative is full of ideas upside down and backwards, including many reversals of cause and effect. It is like a massive hot air balloon, so why doesn’t it deflate? Answer: It is because so many interests are served by keeping it alive and pumping up public fears. In this brief video, Richard Lindzen explains how it serves politicians, NGOs and the media to be on the global warming bandwagon. In addition, there are businesses and industries that can and do contribute to global warming fears to further their own interests. For example,Terence Corcoran explains how the insurance industry benefits by promoting global warming in his Financial Post article Why insurers keep hyping ‘climate risks’ that don’t materialize Excerpts in italics with my bolds. For more than two decades, insurance firms facing rising property damage costs in Canada and abroad have sought some kind of salvation in the environmental movement’s climate change crusade. The latest insurance industry initiative wanders even deeper into the quagmire of green policy advocacy. Combating Canada’s Rising Flood Costs, a new report from the Insurance Bureau of Canada (IBC), urged governments across the country to adopt “natural infrastructure” to limit escalating climate change risks. The evidence was non-existent then, and not much has changed in the interim, despite the industry’s claim that climate-driven flood risk is escalating. According to the insurers, Canada needs all levels of government to turn to natural and “green” infrastructure before installing traditional “grey” infrastructure. The first priority is to retain existing ponds, streams, trees and other natural infrastructure systems, according to the report. The second is to rebuild and replace natural infrastructure that has been lost. And the third — building new and replacing old sewers, pipes, concrete drainways, diversions, improved building techniques — should be undertaken only on a “build what you must” basis. However, that’s not what the Ontario Society of Professional Engineers recommends. In an April report for provincial officials it said: “Numerous studies have demonstrated that green infrastructure does not provide a flood risk reduction benefit.” The engineers advised that protective plumbing, pump-station modifications and sanitary-sewer improvements are among the measures that should be taken to control urban flooding. Insurers have an understandable self-interest in promoting infrastructure spending and government policies, laws and regulations that would protect their businesses from rising insurance claims. But the report reads like a document from the World Wildlife Fund. It was sponsored by the IBC and “generously supported” by Intact Financial Corp., Canada’s largest insurance company. The University of Waterloo-based Intact Centre on Climate Adaptation (funded by Intact, which has given millions to the centre) was also involved. Despite the heavy corporate involvement, the CBC opened up about 10 minutes of The National, it’s flagship news show, to the industry report when it was released last month. Would The National give the pipeline, mining and telecom companies 10 minutes to promote their views? Feltmate added the magnitude of flooding, which is the No. 1 cost due to climate change in the country, is increasing. Such climate warnings have been official insurance industry mantra since the 1990s. Flooding and extreme weather are becoming more frequent, the industry said again and again. Despite a lack of evidence, the industry recently claimed conditions are so bad in Canada that “weather events that used to occur every 40 years now happen every six years” — a factoid attributed to a 2012 IBC-commissioned report by veteran Western University climatologist and climate-policy activist Gordon McBean. He cited an Environment Canada report to support the 40-to-six claim, but in 2016 Canadian Underwriter magazine published a note quoting an Environment Canada official who said studies “have not shown evidence to support” the 40-to-six year frequency shift. The claim has since been scrubbed from the insurance industry’s communications on climate issues. The graphic contains three dubious elements as a source for a flood report. First is an inconsistency in the source of data, a problem identified by Robert Muir, a professional engineer and member of in infrastructure task force at the Ontario Society of Professional Engineers. The 1983–2007 data set was collected through informal industry surveys, while the 2008–2017 data are tabulated systematically by an independent agency. Data inconsistency may explain the bizarre result that the insurance industry had zero losses due to floods, water, rain and storm perils in four of 17 years between 1983 and 2000. Second, the IBC graph also counts fire losses, including the Fort McMurray fire of 2016 — an event unrelated to flood risk. Removal of fire losses significantly flattens the curve (see the second accompanying chart). If the 2013 floods in Alberta and Toronto are treated as possible one-off freak events, the average insurance losses come to $182 million in the 1990s, $198 million during the 2000s and $268 million over the past nine years, which is not a dramatic shift considering there are many other explanations for insurance losses, including increasing individual wealth beyond mere per capita GDP values, urbanization, failure of governments to maintain decaying ancient water infrastructures, and the risks people take by moving into flood-prone areas. 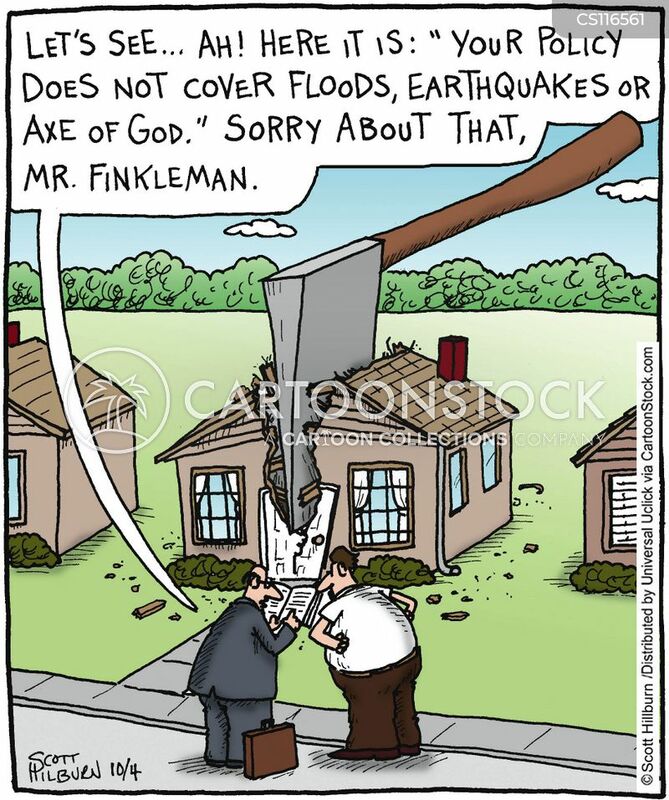 The insurance industry has an obvious motive in highlighting flood risk. It is part of a concerted climate campaign by NGOs, governments and sustainable development advocates. As one executive put it at a 2016 conference the objective is to “monetize” the flood risk, an idea the IBC is pushing with the help of a relatively new “flood model” that identifies high-risk areas. When risks are real, people should of course take steps to avoid them or get protection, including taking out insurance. But the industry seems to be heading in a questionable direction by promoting insurance for climate risks that may not exist and at the same time advocating for green protective infrastructure (see below) that will cost more and may — if the engineers are right — increase the risk. William Mason Gray (1929-2016), pioneering hurricane scientist and forecaster and professor of atmospheric science at Colorado State University. Dr. William Gray made a compelling case for H2O as the climate thermostat, prior to his death in 2016. Thanks to GWPF for publishing posthumously Bill Gray’s understanding of global warming/climate change. The paper was compiled at his request, completed and now available as Flaws in applying greenhouse warming to Climate Variability This post provides some excerpts in italics with my bolds and some headers. Readers will learn much from the entire document (title above is link to pdf). The critical argument that is made by many in the global climate modeling (GCM) community is that an increase in CO2 warming leads to an increase in atmospheric water vapor, resulting in more warming from the absorption of outgoing infrared radiation (IR) by the water vapor. Water vapor is the most potent greenhouse gas present in the atmosphere in large quantities. Its variability (i.e. global cloudiness) is not handled adequately in GCMs in my view. In contrast to the positive feedback between CO2 and water vapor predicted by the GCMs, it is my hypothesis that there is a negative feedback between CO2 warming and and water vapor. CO2 warming ultimately results in less water vapor (not more) in the upper troposphere. The GCMs therefore predict unrealistic warming of global temperature. I hypothesize that the Earth’s energy balance is regulated by precipitation (primarily via deep cumulonimbus (Cb) convection) and that this precipitation counteracts warming due to CO2. Figure 14: Global surface temperature change since 1880. The dotted blue and dotted red lines illustrate how much error one would have made by extrapolating a multi-decadal cooling or warming trend beyond a typical 25-35 year period. Note the recent 1975-2000 warming trend has not continued, and the global temperature remained relatively constant until 2014. Warm the atmosphere by 180◦C if all CO2 energy gain was utilized for this purpose – actual warming over this period has been about 0.5◦C, or many hundreds of times less. Warm the top 100 meters of the globe’s oceans by over 5◦C – actual warming over this period has been about 0.5◦C, or 10 or more times less. Melt sufficient land-based snow and ice as to raise the global sea level by about 6.4 m. The actual rise has been about 8–9 cm, or 60–70 times less. The gradual rise of sea level has been only slightly greater over the last ~50 years (1965–2015) than it has been over the previous two ~50-year periods of 1915–1965 and 1865–1915, when atmospheric CO2 gain was much less. Increase global rainfall over the past ~50-year period by 60 cm. If CO2 gain is the only influence on climate variability, large and important counterbalancing influences must have occurred over the last 50 years in order to negate most of the climate change expected from CO2’s energy addition. Similarly, this hypothesized CO2-induced energy gain of 1 W/m2 over 50 years must have stimulated a compensating response that acted to largely negate energy gains from the increase in CO2. The continuous balancing of global average in-and-out net radiation flux is therefore much larger than the radiation flux from anthropogenic CO2. For example, 342 W/m2, the total energy budget, is almost 100 times larger than the amount of radiation blockage expected from a CO2 doubling over 150 years. If all other factors are held constant, a doubling of CO2 requires a warming of the globe of about 1◦C to enhance outward IR flux by 3.7 W/m2 and thus balance the blockage of IR flux to space. Figure 2: Vertical cross-section of the annual global energy budget. Determined from a combination of satellite-derived radiation measurements and reanalysis data over the period of 1984–2004. This pure IR energy blocking by CO2 versus compensating temperature increase for radiation equilibrium is unrealistic for the long-term and slow CO2 increases that are occurring. Only half of the blockage of 3.7 W/m2 at the surface should be expected to go into an temperature increase. The other half (about 1.85 W/m2) of the blocked IR energy to space will be compensated by surface energy loss to support enhanced evaporation. This occurs in a similar way to how the Earth’s surface energy budget compensates for half its solar gain of 171 W/m2 by surface-to-air upward water vapor flux due to evaporation. Assuming that the imposed extra CO2 doubling IR blockage of 3.7 W/m2 is taken up and balanced by the Earth’s surface in the same way as the solar absorption is taken up and balanced, we should expect a direct warming of only ~0.5◦C for a doubling of CO2. The 1◦C expected warming that is commonly accepted incorrectly assumes that all the absorbed IR goes to the balancing outward radiation with no energy going to evaporation. A major premise of the GCMs has been their application of the National Academy of Science (NAS) 1979 study3 – often referred to as the Charney Report – which hypothesized that a doubling of atmospheric CO2 would bring about a general warming of the globe’s mean temperature of 1.5–4.5◦C (or an average of ~3.0◦C). These large warming values were based on the report’s assumption that the relative humidity (RH) of the atmosphere remains quasiconstant as the globe’s temperature increases. This assumption was made without any type of cumulus convective cloud model and was based solely on the Clausius–Clapeyron (CC) equation and the assumption that the RH of the air will remain constant during any future CO2-induced temperature changes. If RH remains constant as atmospheric temperature increases, then the water vapor content in the atmosphere must rise exponentially. With constant RH, the water vapor content of the atmosphere rises by about 50% if atmospheric temperature is increased by 5◦C. Upper tropospheric water vapor increases act to raise the atmosphere’s radiation emission level to a higher and thus colder level. This reduces the amount of outgoing IR energy which can escape to space by decreasing T^4. These model predictions of large upper-level tropospheric moisture increases have persisted in the current generation of GCM forecasts.§ These models significantly overestimate globally-averaged tropospheric and lower stratospheric (0–50,000 feet) temperature trends since 1979 (Figure 7). Figure 8: Decline in upper tropospheric RH. Annually-averaged 300 mb relative humidity for the tropics (30°S–30°N). From NASA-MERRA2 reanalysis for 1980–2016. Black dotted line is linear trend. All of these early GCM simulations were destined to give unrealistically large upper-tropospheric water vapor increases for doubling of CO2 blockage of IR energy to space, and as a result large and unrealistic upper tropospheric temperature increases were predicted. In fact, if data from NASA-MERRA24 and NCEP/NCAR5 can be believed, upper tropospheric RH has actually been declining since 1980 as shown in Figure 8. The top part of Table 1 shows temperature and humidity differences between very wet and dry years in the tropics since 1948; in the wettest years, precipitation was 3.9% higher than in the driest ones. Clearly, when it rains more in the tropics, relative and specific humidity decrease. A similar decrease is seen when differencing 1995–2004 from 1985–1994, periods for which the equivalent precipitation difference is 2%. Such a decrease in RH would lead to a decrease in the height of the radiation emission level and an increase in IR to space. What has prevented this extra CO2-induced energy input of the last 50 years from being realized in more climate warming than has actually occurred? Why was there recently a pause in global warming, lasting for about 15 years? The compensating influence that prevents the predicted CO2-induced warming is enhanced global surface evaporation and increased precipitation. Annual average global evaporational cooling is about 80 W/m2 or about 2.8 mm per day. A little more than 1% extra global average evaporation per year would amount to 1.3 cm per year or 65 cm of extra evaporation integrated over the last 50 years. This is the only way that such a CO2-induced , 1 W/m2 IR energy gain sustained over 50 years could occur without a significant alteration of globally-averaged surface temperature. This hypothesized increase in global surface evaporation as a response to CO2-forced energy gain should not be considered unusual. All geophysical systems attempt to adapt to imposed energy forcings by developing responses that counter the imposed action. In analysing the Earth’s radiation budget, it is incorrect to simply add or subtract energy sources or sinks to the global system and expect the resulting global temperatures to proportionally change. This is because the majority of CO2-induced energy gains will not go into warming the atmosphere. Various amounts of CO2-forced energy will go into ocean surface storage or into ocean energy gain for increased surface evaporation. Therefore a significant part of the CO2 buildup (~75%) will bring about the phase change of surface liquid water to atmospheric water vapour. The energy for this phase change must come from the surface water, with an expenditure of around 580 calories of energy for every gram of liquid that is converted into vapour. The surface water must thus undergo a cooling to accomplish this phase change. Therefore, increases in anthropogenic CO2 have brought about a small (about 0.8%) speeding up of the globe’s hydrologic cycle, leading to more precipitation, and to relatively little global temperature increase. Therefore, greenhouse gases are indeed playing an important role in altering the globe’s climate, but they are doing so primarily by increasing the speed of the hydrologic cycle as opposed to increasing global temperature. cumulus convection would act to alter radiation flux to space. It is my hypothesis that the increase in global precipitation primarily arises from an increase in deep tropical cumulonimbus (Cb) convection. The typical enhancement of rainfall and updraft motion in these areas together act to increase the return flow mass subsidence in the surrounding broader clear and partly cloudy regions. 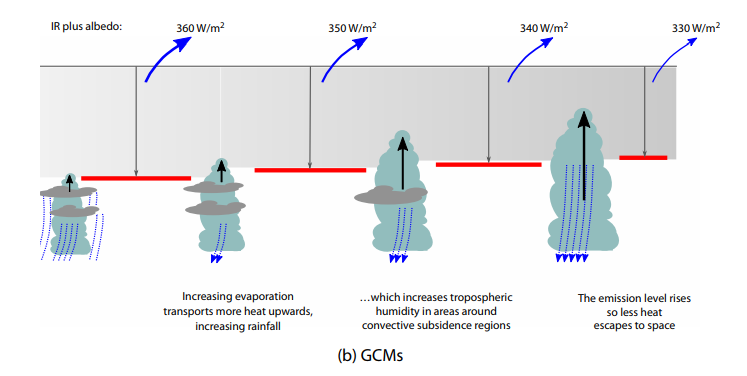 The upper diagram in Figure 9 illustrates the increasing extra mass flow return subsidence associated with increasing depth and intensity of cumulus convection. 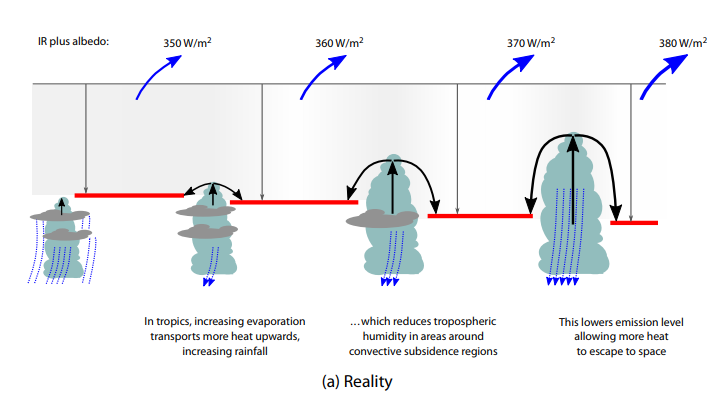 Rainfall increases typically cause an overall reduction of specific humidity (q) and relative humidity (RH) in the upper tropospheric levels of the broader scale surrounding convective subsidence regions. This leads to a net enhancement of radiation flux to space due to a lowering of the upper-level emission level. This viewpoint contrasts with the position in GCMs, which suggest that an increase in deep convection will increase upper-level water vapour. 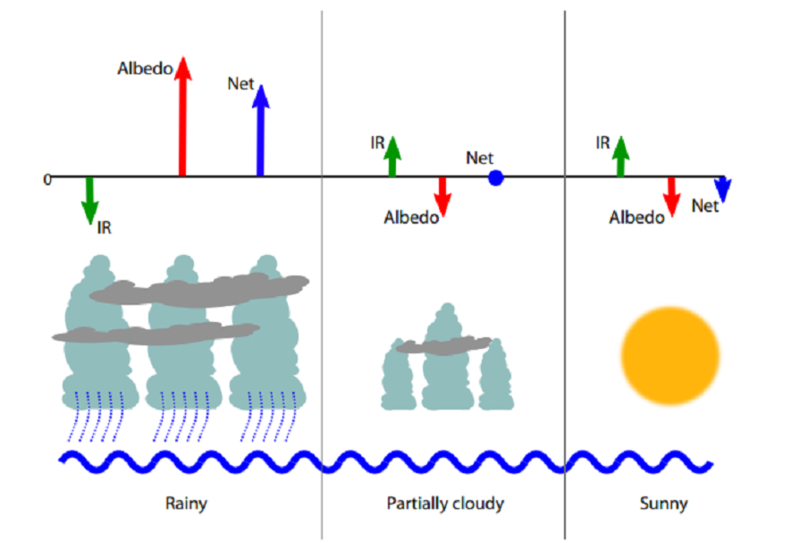 Figure 10: Conceptual model of typical variations of IR, albedo and net (IR + albedo) associated with three different areas of rain and cloud for periods of increased precipitation. 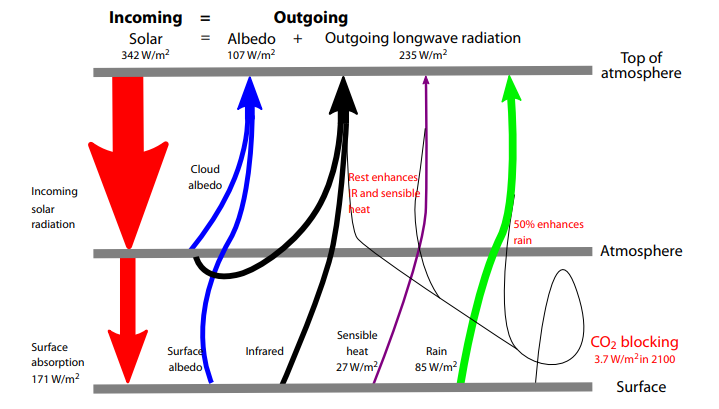 The albedo enhancement over the cloud–rain areas tends to increase the net (IR + albedo) radiation energy to space more than the weak suppression of (IR + albedo) in the clear areas. Near-neutral conditions prevail in the partly cloudy areas. The bottom diagram of Figure 9 illustrates how, in GCMs, Cb convection erroneously increases upper tropospheric moisture. Based on reanalysis data (Table 1, Figure 8) this is not observed in the real atmosphere. A slowing down of the global ocean’s MOC is the likely cause of most of the global warming that has been observed since the latter part of the 19th century.15 I hypothesize that shorter multi-decadal changes in the MOC16 are responsible for the more recent global warming periods between 1910–1940 and 1975–1998 and the global warming hiatus periods between 1945–1975 and 2000–2013. Figure 13 shows the circulation features that typically accompany periods when the MOC is stronger than normal and when it is weaker than normal. In general, a strong MOC is associated with a warmer-than-normal North Atlantic, increased Atlantic hurricane activity, increased blocking action in both the North Atlantic and North Pacific and weaker westerlies in the mid-latitude Southern Hemisphere. There is more upwelling of cold water in the South Pacific and Indian Oceans, and an increase in global rainfall of a few percent occurs. This causes the global surface temperatures to cool. The opposite occurs when the MOC is weaker than normal. The average strength of the MOC over the last 150 years has likely been below the multimillennium average, and that is the primary reason we have seen this long-term global warming since the late 19th century. The globe appears to be rebounding from the conditions of the Little Ice Age to conditions that were typical of the earlier ‘Medieval’ and ‘Roman’ warm periods. The Earth is covered with 71% liquid water. Over the ocean surface, sub-saturated winds blow, forcing continuous surface evaporation. Observations and energy budget analyses indicate that the surface of the globe is losing about 80 W/m2 of energy from the global surface evaporation process. This evaporation energy loss is needed as part of the process of balancing the surface’s absorption of large amounts of incoming solar energy. 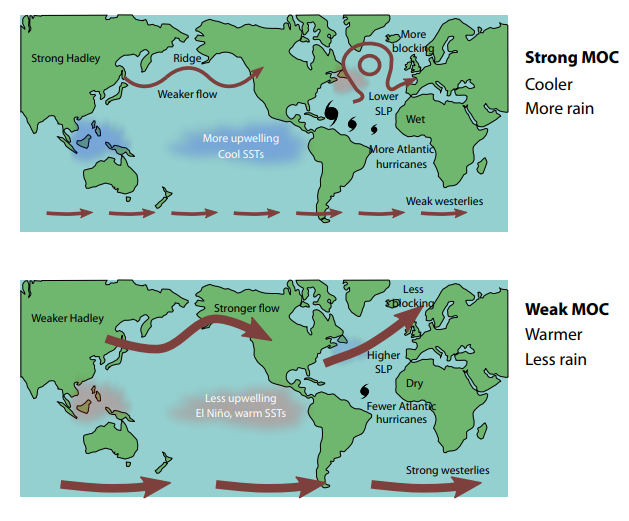 Variations in the strength of the globe’s hydrologic cycle are the way that the global climate is regulated. The stronger the hydrologic cycle, the more surface evaporation cooling occurs, and greater the globe’s IR flux to space. The globe’s surface cools when the hydrologic cycle is stronger than average and warms when the hydrologic cycle is weaker than normal. The strength of the hydrologic cycle is thus the primary regulator of the globe’s surface temperature. 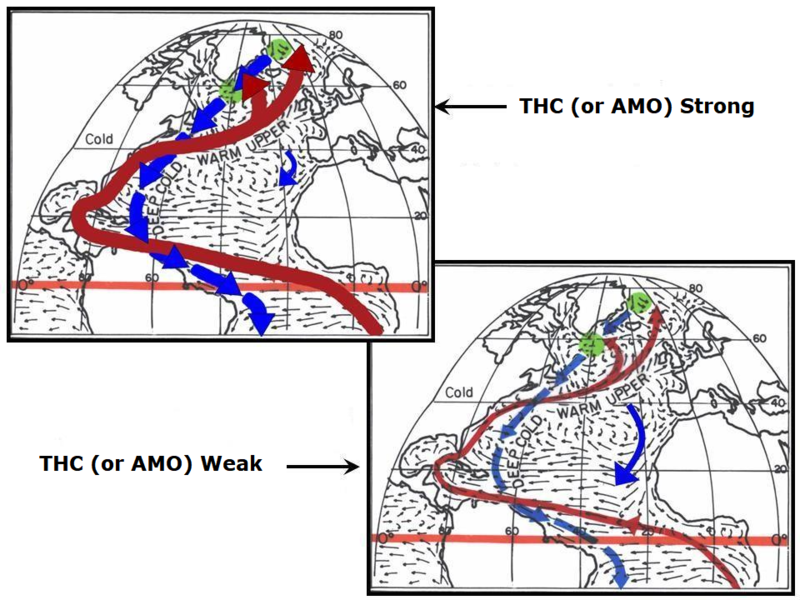 Variations in global precipitation are linked to long-term changes in the MOC (or THC). I have proposed that any additional warming from an increase in CO2 added to the atmosphere is offset by an increase in surface evaporation and increased precipitation (an increase in the water cycle). My prediction seems to be supported by evidence of upper tropospheric drying since 1979 and the increase in global precipitation seen in reanalysis data. I have shown that the additional heating that may be caused by an increase in CO2 results in a drying, not a moistening, of the upper troposphere, resulting in an increase of outgoing radiation to space, not a decrease as proposed by the most recent application of the greenhouse theory. Deficiencies in the ability of GCMs to adequately represent variations in global cloudiness, the water cycle, the carbon cycle, long-term changes in deep-ocean circulation, and other important mechanisms that control the climate reduce our confidence in the ability of these models to adequately forecast future global temperatures. It seems that the models do not correctly handle what happens to the added energy from CO2 IR blocking. Figure 13: Effect of changes in MOC: top, strong MOC; bottom weak MOC. SLP: sea level pressure; SST, sea surface temperature. Solar variations, sunspots, volcanic eruptions and cosmic ray changes are energy-wise too small to play a significant role in the large energy changes that occur during important multi-decadal and multi-century temperature changes. It is the Earth’s internal fluctuations that are the most important cause of climate and temperature change. These internal fluctuations are driven primarily by deep multi-decadal and multi-century ocean circulation changes, of which naturally varying upper-ocean salinity content is hypothesized to be the primary driving mechanism. Salinity controls ocean density at cold temperatures and at high latitudes where the potential deep-water formation sites of the THC and SAS are located. North Atlantic upper ocean salinity changes are brought about by both multi-decadal and multi-century induced North Atlantic salinity variability. The Supreme Court’s Next Climate Change Case? Phil Goldberg writes at RealClearPolicy The Supreme Court’s Next Climate Change Case? Excerpts in italics with my bolds. It is certainly understandable that environmentalists are frustrated by the Trump administration’s lack of progress in dealing with climate change, just as they have been with other administrations. Since the 1970s, they have been sounding the alarm and calling for regulations on greenhouse gasses. But, as Judge William Alsup, a Clinton appointee, stated at a hearing in a different climate-change lawsuit in March, it is “hard to say that [energy producers] were secretly aware” of climate change. Judge Alsup later dismissed that lawsuit, which was brought by the City of Oakland. 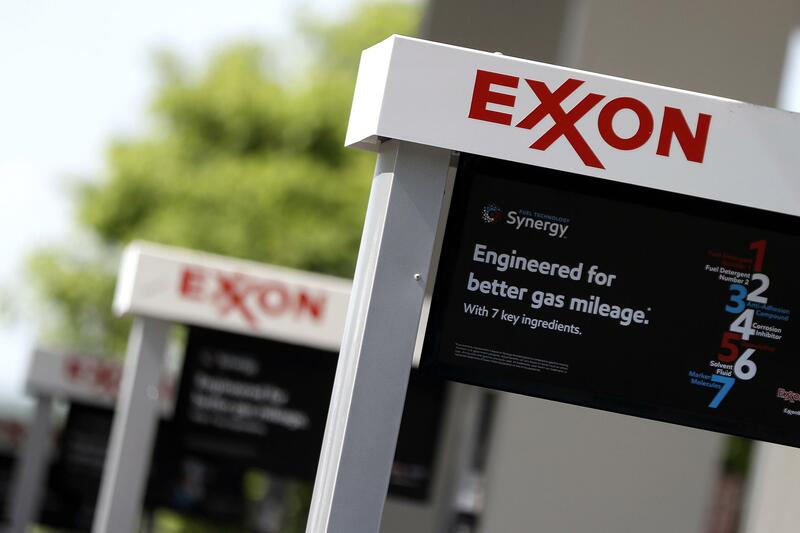 Meanwhile, the legal issue in ExxonMobil’s case against Attorney General Healey is whether the state even has the jurisdiction to conduct this investigation. Under the Constitution, states have jurisdiction only over certain legal matters. There are two ways a state can get jurisdiction over a private company. Here, ExxonMobil would have to be “at home” (think legal resident) in Massachusetts, which it is not. Or, Massachusetts would have to show that the conduct at issue — the company’s statements and knowledge related to climate change — occurred within Massachusetts or were sufficiently tied to Massachusetts such that the state has “specific jurisdiction” over them. Jurisdictional issues aside, sending a civil investigative demand to a private business is a powerful law enforcement tool. It should be reserved for only those situations where there is evidence suggesting a material violation of law. 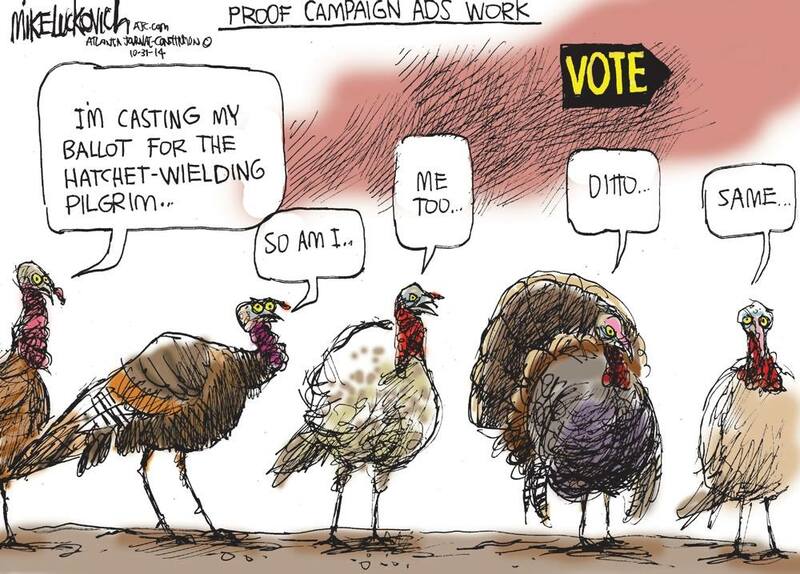 They should not be used for political purposes. Progressives who would cheer General Healey should keep in mind that, if successful, the authority she is asserting could easily be used by conservative attorneys general or conservative judges to impose conservative agendas. That’s why former Clinton Labor Secretary Robert Reich years ago called these types of actions “faux democracy.” The right way to impose a political agenda is to win elections and control Congress and the presidency. The Supreme Court should consider taking this case. It speaks to foundational issues of our representative democracy. Before getting into the federal/provincial tug of war, let’s consider the basic belief. Angus Reid has been asking Canadians the same question since 2009, with these responses. Open image in new tab to enlarge. Note in 2009 63% believed that “global warming is a fact and mostly caused by humans”. That dropped down to 52%, then came back to 62% in 2014 when the Obama administration was beating the climate change drum for all it was worth. In Canada Trudeau’s Liberal party led in the polls on the way to winning power in October 2015. Now let’s consider the polling in July of 2018. Belief in man-made global warming is back down to 56% in the context of Trump’s skepticism and the Paris Accord proving ineffectual. This first 2018 chart includes regional and age distributions showing that younger people (<35 yrs old) are much more often believers, becoming more skeptical (50/50) with age. Ironically, that young cohort has not witnessed any actual warming in their adult lives. The three largest cities in Canada are Vancouver, Toronto and Montreal. Not surprisingly, belief is strongest in the provinces of B.C., Ontario and Quebec, along with Atlantic region. The prairie provinces are definitely not on side. Another table shows that income level is not a driver, except for the more wealthy being somewhat surer of their opinions. 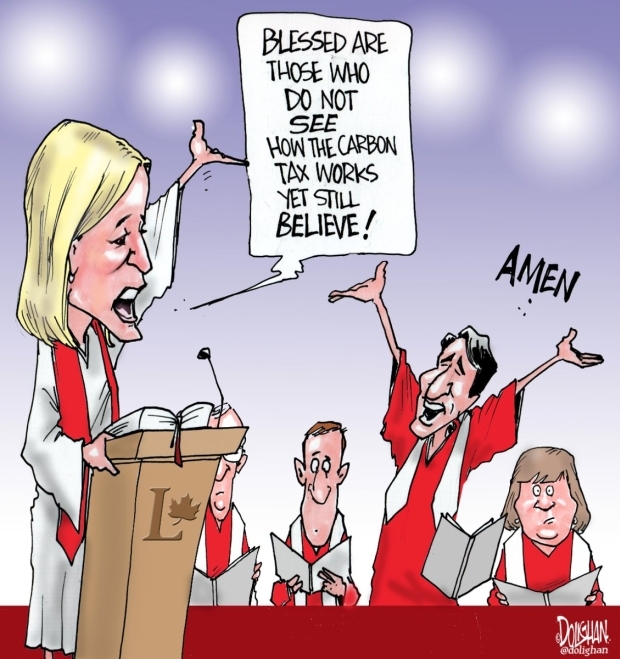 However, global warming belief is strongly associated with university education, and with voting for left-wing parties (in Canada Liberal and NDP). It seems the educational system is aligned with left wing views on many things, including the climate. Angus Reid asked the same questions of Canadian, British and American citizens in 2010, with these results in the context of Obama mania and the Copenhagen COP drama. 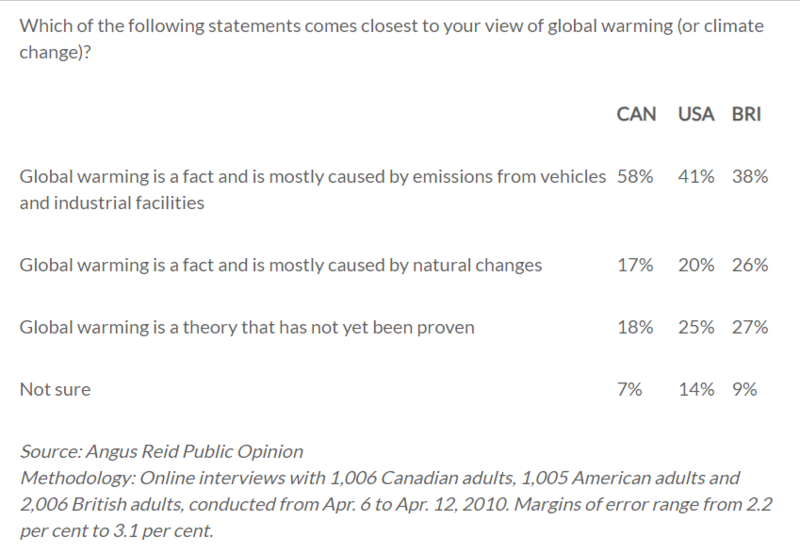 In 2010 the majority of Americans and Brits were not global warming believers, compared to Canadians. Note that Americans and Brits are more likely to say global warming is either natural or an unproven theory. More recent polls in those two countries continue to show the same pattern. Moreover, both Ontario and Quebec have recently elected business-oriented provincial premiers, with Alberta likely to follow suit in the next election on or before May 31, 2019. That may explain this result. Angus Reid observed that those who want no tax at all opted for provincial jurisdiction. We are witnessing the spectacle of a high-ranking Federal District Court Judge twisting the law to suit her empathy for climate activists. This is playing out as a lawsuit brought by Our Children’s Trust with kids as willing human shields in the “fight against climate change.” (Background resources at the end) The proceedings have gone on for several years with no end in sight unless a higher court stops it. The next segment is a long (50 courtroom days) hearing on the merits scheduled to begin October 29, 2018. With respect to standing, the district court concluded that respondents had adequately alleged injuries in the form of increased droughts, wildfires, flooding, and other effects of climate change, and that those injuries were caused by the government’s regulation of (and failure to further regulate) fossil fuels. App., infra, 125a-134a. The court further concluded that it could redress respondents’ alleged injuries by granting the relief sought, including ordering the federal government “to cease [its] permitting, authorizing, and subsidizing of fossil fuels and, instead, move to swiftly phase out CO2 emissions” and to “take such other action necessary to ensure that atmospheric CO2 is no more concentrated than 350 ppm by 2100, including to develop a national plan to restore Earth’s energy balance, and implement that national plan so as to stabilize the climate system.” Id. at 137a (citation omitted); see id. at 134a-137a. On the merits, the district court concluded that respondents had stated a claim under the Fifth Amendment’s Due Process Clause. App., infra, 137a-147a. Relying primarily on this Court’s decision in Obergefell v. Hodges, 135 S. Ct. 2584 (2015), as well as Roe v. Wade, 410 U.S. 113 (1973), and a 1993 decision from the Supreme Court of the Philippines, the district court found in the Fifth Amendment’s protection against the deprivation of “life, liberty, or property, without due process of law,” U.S. Const. Amend. V, a previously unrecognized “fundamental right * * * to a climate system capable of sustaining human life.” App., infra, 142a; see id. at 140a-142a. The district court further determined that respondents had adequately stated a claim under a federal publictrust theory. App., infra, 147a-167a. The court acknowledged this Court’s statement that “the public trust doctrine remains a matter of state law,” PPL Montana, LLC v. Montana, 565 U.S. 576, 603 (2012), as well as the D.C. Circuit’s rejection of a federal public-trust doctrine, see Alec L. ex rel. Loorz v. McCarthy, 561 Fed. Appx. 7, 8 (per curiam), cert. denied, 135 S. Ct. 774 (2014). But the court nevertheless concluded that a public-trust doctrine imposes a judicially enforceable prohibition on the federal government against “depriving a future legislature of the natural resources necessary to provide for the well-being and survival of its citizens.” App., infra, 148a (citation omitted). Respondents’ position amounts to the astounding assertion that permitting or encouraging the combustion of fossil fuels violates the Due Process Clause of the Constitution and a single district court in a suit brought by a handful of plaintiffs may decree the end of the carbon-based features of the United States’ energy system, without regard to the statutory and regulatory framework Congress enacted to address such issues with broad public input. Months ago, this Court flagged the “striking” breadth of those claims and the “substantial” doubts about their justiciability, reciting the standard for interlocutory certification and thereby indicating that appellate review is warranted before trial. United States v. U.S. Dist. Court, No. 18A65, 2018 WL 3615551, at *1 (July 30, 2018). But the district court nevertheless refused to meaningfully narrow respondents’ claims, to certify its orders for interlocutory appeal, or to halt the trial now set to begin in less than two weeks. The government therefore has no choice but to ask this Court once again to intervene— and to end this profoundly misguided suit. In its most recent order, the court contemplates some of the “actions” that petitioners could take to redress respondents’ asserted injuries, including drastic measures like phasing out all greenhouse gas emissions “within several decades” or converting the Nation’s entire electricity generation infrastructure to “100 percent clean, renewable wind, water, and sunlight” sources. Id. at 54a (brackets and citation omitted). But neither respondents nor the court has cited any legal authority that would permit such an unprecedented usurpation of legislative and executive authority by an Article III court, essentially placing a single district court in Oregon—acting at the behest of a few plaintiffs having one particular perspective on the complex issues involved—in charge of directing American energy and environmental policy. Nor have respondents or the district court grappled with the fact that the carbon emissions arguably within the control of petitioners “may become an increasingly marginal portion of global emissions” as developing countries increase their own emissions, thereby making it all the more speculative and uncertain that even respondents’ unprecedented remedy would actually redress their asserted injuries. This is no ordinary lawsuit. Plaintiffs challenge the policies, acts, and omissions of the President of the United States, the Council on Environmental Quality, the Office of Management and Budget, the Office of Science and Technology Policy, the Department of Energy, the Department of the Interior, the Department of Transportation (‘‘DOT’’), the Department of Agriculture, the Department of Commerce, the Department of Defense, the Department of State, and the Environmental Protection Agency (‘‘EPA’’). This lawsuit challenges decisions defendants have made across a vast set of topics—decisions like whether and to what extent to regulate CO2 emissions from power plants and vehicles, whether to permit fossil fuel extraction and development to take place on federal lands, how much to charge for use of those lands, whether to give tax breaks to the fossil fuel industry, whether to subsidize or directly fund that industry, whether to fund the construction of fossil fuel infrastructure such as natural gas pipelines at home and abroad, whether to permit the export and import of fossil fuels from and to the United States, and whether to authorize new marine coal terminal projects. Plaintiffs assert defendants’ decisions on these topics have substantially caused the planet to warm and the oceans to rise. They draw a direct causal line between defendants’ policy choices and floods, food shortages, destruction of property, species extinction, and a host of other harms. This lawsuit is not about proving that climate change is happening or that human activity is driving it. For the purposes of this motion, those facts are undisputed.3 The questions before the Court are whether defendants are responsible for some of the harm caused by climate change, whether plaintiffs may challenge defendants’ climate change policy in court, and whether this Court can direct defendants to change their policy without running afoul of the separation of powers doctrine. Unlike in the constitutional provisions at issue Nixon and Passman, the constitutional provisions cited here contain nothing approaching a clear reference to the subject matter of this case. The Constitution does not mention environmental policy, atmospheric emissions, or global warming. And unlike in Zivotofksy, climate change policy is not a fundamental power on which any other power allocated exclusively to other branches of government rests. The question is not whether a case implicates issues that appear in the portions of the Constitution allocating power to the Legislative and Executive Branches—such a test would, by definition, shield nearly all legislative and executive action from legal challenge, Rather, the question is whether adjudicating a claim would require the Judicial Branch to second-guess decisions committed exclusively to another branch of government. Federal defendants urge that plaintiffs’ claims based on the state created danger doctrine must fail. First, they argue that plaintiffs do not show a special relationship between themselves and the government. More importantly, federal defendants argue that plaintiffs cannot show that government conduct proximately caused a dangerous situation in deliberate indifference to plaintiffs’ safety or that harm or loss of life has resulted from such conduct. Plaintiffs contend that they have proffered ample evidence to show genuine issues of material fact as to whether federal defendants have liability for the conduct alleged in their complaint. Federal defendants’ main argument is that plaintiffs’ allegations regarding the government’s knowledge of the dangers posed to plaintiffs by climate change do not rise to the required level of “deliberate indifference.”Plaintiffs specifically refer to the declaration from their expert Gus Speth, former chairman of the Council on Environmental Quality under President Jimmy Carter. Mr. Speth’s declaration examines a historical record spanning ten presidential administrations and references a number of documents, statements of government officials, and federal policy actions that go directly to the government’s knowledge of the links between fossil fuels and increasing global mean temperature and the dangers associated therein, such as sea level rise to Americans at the time and in future. The process is a simple one. Carbon dioxide in the atmosphere has the effect of a pane of glass in a greenhouse. The CO2 content is normally in a stable cycle, but recently man has begun to introduce instability through the burning of fossil fuels. At the turn of the century several persons raised the question whether this would change the temperature of the atmosphere. Over the years the hypothesis has been refined, and more evidence has come along to support it. It is now pretty clearly agreed that the CO2 content will rise 25 [percent] by 2000. This could increase the average temperature near the earth’s surface by 7 degrees Fahrenheit. This in turn could raise the level of the sea by 10 feet. Goodbye New York. Goodbye Washington, for that matter. In 1977, President Jimmy Carter’s science advisor Frank Press wrote to the President explaining: Fossil fuel combustion has increased at an exponential rate over the last 100 years. As a result, the atmospheric concentration of CO2 is now 12 percent above the pre-industrial revolution level and may grow 1.5 to 2.0 times that level within 60 years. Because of the greenhouse effect of atmospheric CO2, the increased concentration will induce a global climatic warming of anywhere from 0.5° to 5° C.
Federal defendants argue that these declarations fail to show that plaintiffs’ injuries are concrete and particularized to them; rather federal defendants’ contend that the injuries alleged are generalized widespread environmental phenomena which affect all other humans on the planet, making them nonjusticiable. The most recent Supreme Court precedent appears to have rejected the notion that injury to all is injury to none for standing purposes.”); Pye v. United States, 269 F.3d 459, 469 (4th Cir. 2001) (“So long as the plaintiff . . . has a concrete and particularized injury, it does not matter that legions of other persons have the same injury.”). Indeed, even if the experience at the root of [the] complaint was shared by virtually every American,” the inquiry remains whether that shared experience caused an injury that is concrete and particular to the plaintiff. Jewel, 673 F.3d at 910. Plaintiffs submit evidence that fossil fuel emissions are responsible for most of the increase in atmospheric CO2, and that increasing CO2, in turn, is the main cause of global warming, and that atmospheric concentrations of greenhouse gasses, due to fossil fuel combustion, are increasing quickly such that planetary warming is accelerating at rates never before seen in human history. Hansen Decl. Ex. A, at 38. Further, not only are concentrations of atmospheric CO2 continuing to increase, but the rate of increase has also nearly doubled since measurements began being recorded pushing humanity closer to the “point of no return.” Id. at 29, 38. Estimates show that extreme weather events are likely to continue to increase as the global surface temperature continues to rise. Id. at 35; Trenberth Decl. Ex. 1, at 1, 8, 13. Indeed, the five hottest years in the 123 years of record-keeping in the United States have all occurred in the past decade. Trenberth Decl. Ex. 1, at 3. Plaintiffs present evidence that 2017 saw record setting events such as extreme wildfires in the western United States8 and abnormally strong hurricanes in the southeastern United States and Gulf of Mexico (Hurricanes Harvey, Irma, and Maria), all of which were exacerbated by climate change. Id. at 7-11. Further, plaintiffs offer that global sea level rise will continue unabated under current conditions. Plaintiffs’ expert Dr. James Hansen has submitted video animations showing how the future impacts of seal level rise will flood or impact the livability of the homes of plaintiffs in Louisiana, Oregon, Washington, Florida,New York, and Hawaii based on current assumptions about carbon emission. Hansen Decl. Ex. E-R. The most recent projections from the National Oceanic and Atmospheric Administration (“NOAA”) provide that global mean sea level will rise between 1.5-2.5 m (5-8.2 ft.) by 2100 and that it is expected to continue to rise and even accelerate more after 2100. Wanless Decl. Ex. 1 at 12. In sum, the Court is left with plaintiffs’ sworn affidavits attesting to their specific injuries, as well as a swath of extensive expert declarations showing those injuries are linked to fossil fuel-induced climate change and if current conditions remain unchanged, these injuries are likely to continue or worsen. Here, federal defendants argue again that the association between the conduct of which plaintiffs complain, namely the government’s subsidizing the fossil fuel industry; allowing the transportation, exportation, and importation of fossil fuels; setting of energy and efficiency standards for vehicles, appliances, and buildings; reducing carbon sequestration capacity and expanding areas for fossil fuel extraction and production through federal land leasing policies is tenuous and filled with many intervening actions by third parties. Thus, they argue that plaintiffs have failed to tether their injuries, both direct and indirect, to specific actions of the United States. However, plaintiffs challenge not only the direct emissions of federal defendants through their use of fossil fuels to power its buildings and vehicles10, but also the emissions that are caused and supported by their policies. Plaintiffs have alleged that federal defendants’ systematic conduct, which includes “government policies practices, and actions, showing how each Defendant permits, licenses, leases, authorizes, and/or incentivizes the extraction, development, processing, combustion, and transportation of fossil fuel” caused plaintiffs’ injuries. At this stage of the proceedings, the Court finds that plaintiffs have provided sufficient evidence showing that causation for their claims is more than attenuated. Plaintiffs’ “need not connect each molecule” of domestically emitted carbon to their specific injuries to meet the causation standard. Bellon, 732 F.3d 1142-43. The ultimate issue of causation will require perhaps the most extensive evidence to determine at trial, but at this stage of the proceedings, plaintiffs have proffered sufficient evidence to show that genuine issues of material fact remain on this issue. A final ruling on this issue will benefit from a fully developed factual record where the Court can consider and weigh evidence from both parties. Federal defendants contend that there is no possible redress in this case because the remedies sought by plaintiffs are beyond the Court’s authority to provide.12 Further, they argue that even if this Court did find in favor of plaintiffs, any remedy it fashioned would not redress the harms alleged by plaintiffs, because fossil fuel emissions from other entities would still contribute to continuing global warming. 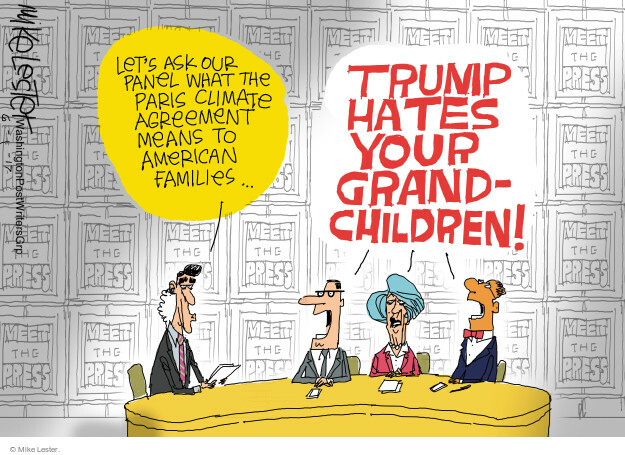 Thus, they argue that there is no evidence that any immediate reduction in emissions caused by the United States would manifest in a reduction of climate change induced weather phenomena. As the Court has stated before, whether the Court could guarantee a reduction in greenhouse gas emission is the wrong inquiry because redressability does not require certainty. Rather, at this stage, it only requires a substantial likelihood that the Court could provide meaningful relief. Moreover, the possibility that some other individual or entity might later cause the same injury does not defeat standing; the question remains whether the injury caused by the defendants in this suit can be redressed. Instead, plaintiffs urge that their request for relief, at its core, is one for a declaration that their constitutional rights have been violated and an order for federal defendants to develop their own plan, using existing resources, capacities, and legal authority, to bring their conduct into constitutional compliance. 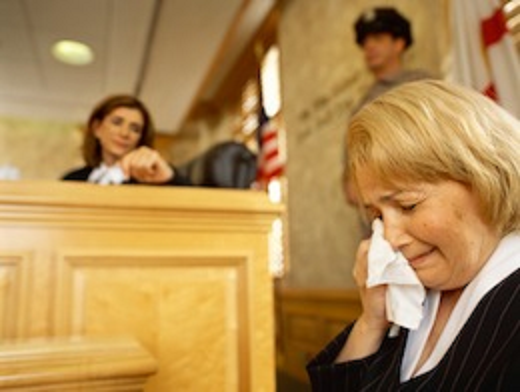 Plaintiffs point to various statutory authorities by which they claim federal defendants could affect the relief they request. The Court has considered the summary judgment record regarding traceability and plaintiffs’ experts’ opinions that reducing domestic emissions, which plaintiffs contend are controlled by federal defendants’ actions, could slow or reduce the harm plaintiffs are suffering. The Court concludes, for the purposes of this motion, that plaintiffs have shown an issue of material fact that must be considered at trial on full factual record. Does the Constitution Provide a Substantive Due-Process Right to a Stable Climate System? Judging objectively is not a sexist matter. 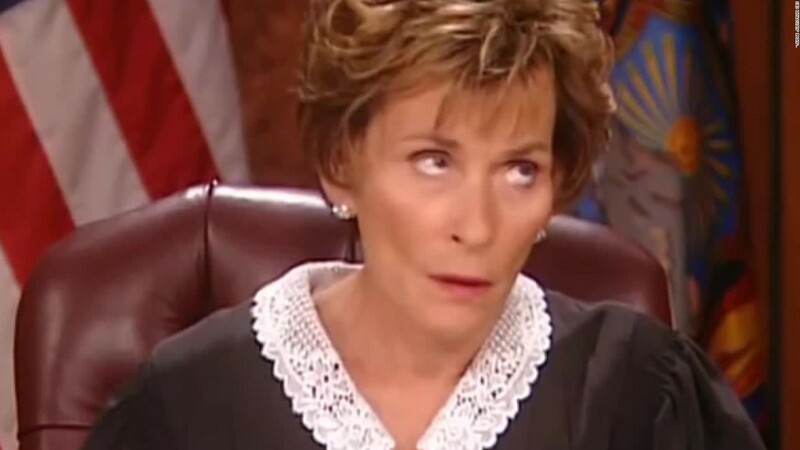 Judge Judy proves women judges can be skeptical as well. Now Gelernter has written an insightful essay on what to like and not to like about Donald Trump (President of the United States). Reprinted below in italics with my bolds. Granted, Mr. Trump is a parody of the average American, not the thing itself. To turn away is fair. But to hate him from your heart is revealing. Many Americas were ashamed when Ronald Reagan was elected. A movie actor? But the new direction he chose for America was a big success on balance, and Reagan turned into a great president. Evidently this country was intended to be run by amateurs after all—by plain citizens, not only lawyers and bureaucrats.